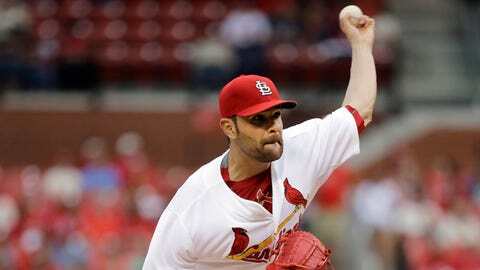 Jaime Garcia has won his last four decisions and the Cardinals have been victorious in his last six starts. The Pittsburgh Pirates may have loosened St. Louis’ grip on the NL Central, but they’ll need Charlie Morton to change his luck against the Cardinals to inch any closer. Morton and the Pirates get that chance Saturday as the pivotal division series against the Cardinals continues at Busch Stadium. The Pirates ended a four-game losing streak Friday with a 9-3 victory, which was just their eighth in 29 games at Busch Stadium since the start of 2013 — including a 1-2 showing there in the 2013 NL Division Series. A win Saturday would give Pittsburgh its first series win in St. Louis since April 26-28, 2013, and more important, cut into the Cardinals’ 5 1/2-game division lead. The Pirates (80-53) need to improve on their 8-21 road record against the Central to chew into that deficit, starting with five games in as many days in St. Louis and Cincinnati. Pittsburgh is 22-32 against its own division. "One of the things we need to be mindful of — and I share this with the guys — is that past performance doesn’t need to predict future performance," manager Clint Hurdle told MLB’s official website. "Past performance needs to be used as information for present success." The Pirates, four games up on the Chicago Cubs in the wild-card race, can build off a 17-hit performance in the opener that moved their season record at Busch to 2-5. The hit total was their most against the Cardinals since June 29, 2012. Morton (8-6, 4.22 ERA) was on the disabled list with a hip injury during Pittsburgh’s first two series against St. Louis this year and didn’t line up to pitch in the next two. The right-hander is 2-10 with a 5.58 ERA in 16 starts against the Cardinals and the Pirates have lost each of his last nine outings against them — a span in which he is 0-7 with a 5.13 ERA. Morton is 1-4 with a 6.38 ERA in eight road starts against the Cardinals. St. Louis (86-48) has lost two straight, but manager Mike Matheny said his team wouldn’t alter its playing style this series. "For us to change how we’ve gone about it and build this series up would be crazy," he told MLB’s official website. "We get that there is a lot of build-up to this, and hopefully there is a buzz in this stadium all weekend long and into next week." Jaime Garcia takes the mound for his first start against the Pirates in three years. Garcia (7-4, 2.03) has won his last four decisions and the Cardinals have been victorious in his last six starts. The left-hander holds a 2.08 ERA during that time. The stretch includes his roughest outing of the year, though, in a 7-5 win over San Francisco on Sunday. Garcia — 1-1 with a 0.84 ERA in three career starts against Pittsburgh — surrendered season highs in hits (10) and earned runs (four) in 6 1/3 innings while finishing with a season-low one strikeout. St. Louis was held scoreless Friday until rookie Stephen Piscotty’s RBI double in the eighth. Piscotty is hitting .426 with 12 RBIs during a career-best 11-game hitting streak. Brandon Moss also kept swinging a hot bat, recording his fourth multi-hit game in a row on the tail end of an eight-game hitting streak in which he is batting .464. Cardinals outfielder Jon Jay entered in the sixth and went 0 for 2 in his return from a left wrist injury that sidelined him in late June. Andrew McCutchen was back in the lineup for the Pirates and went 2 for 4 after missing a game with left knee soreness.